➲ PREMIUM ARTIST QUALITY - REVERSIBLE TIP makes it easy to do both fine and bold work! They\'ll have endless fun creating holiday decorations Christmas. ➲ THE REVERSIBLE CHISEL - BULLET TIP also offers more drawing options to adults as well. 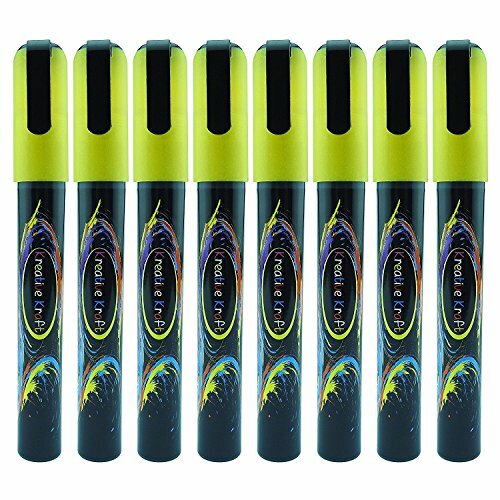 For example, restaurant and bar owners - these chalk pens are great for writing on Bistro boards and menu boards! ➲ GREAT FOR USE on Black Dry Erase boards, Chalkboard Stickers, Chalkboard Contact Paper, Glass, Tile, Plastic, Metal, Whiteboards, Card and ALL Non-Porous Surfaces. ➲ CREATE FANTASTIC, EYE-CATCHING, ATTENTION GRABBING DISPLAYS! Say Bye-Bye to Dusty chalk! Use liquid chalk for a professional edge. ➲ KREATIVE KRAFT CHALK MARKERS are much more vibrant than regular chalk. Just imagine the bright, eye-catching designs you or your child will be able to create with these amazing chalk pens!